These are not your grandmother’s libraries. If books are free entrances into an infinite number of worlds, then ideally, libraries should be just as imaginative. They’re one of the few instances of a traditional public sphere where individuals can gather to study, share ideas, and be entertained, and their modern iterations continue to push for this vital sense of community. Below, we present seven modern library designs that are inspiring and human-centric in design, whether visitors arrive for 1,000-person events or simply to read an intriguing title alone. 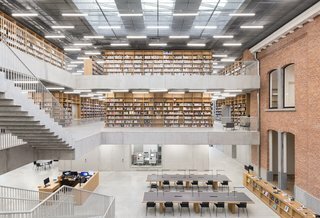 From China to the Netherlands and Qatar to Vietnam, these are the types of modern libraries where the views are as good as the books themselves. Outside, this library fits into its rural surroundings by mimicking the structure of surrounding homes. But its translucent panels give it a modern edge. 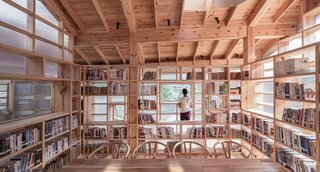 Set in an ancient village and surrounded by ragged, tree-lined mountains, this library—which opened last year—has a traditional frame that complements the architecture of nearby homes. But that's about where the classic touches end. 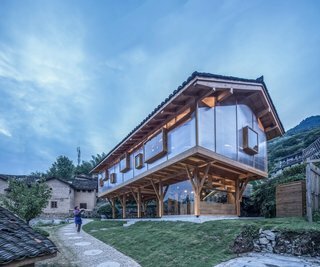 Shulin Architectural Design was commissioned by Hongfu Tourism Group to build a modern, steel-and-wood structure with translucent paneled walls that provide an effervescent quality to the space. The panels allow sunlight to stream into the nearly 1,700-square-foot building during the day, and at night, the structure glows from within. The library's raised foundation makes room for a shaded patio and a pond, too. Inside, pinewood bookshelves surround a reading area without obstructing natural light. 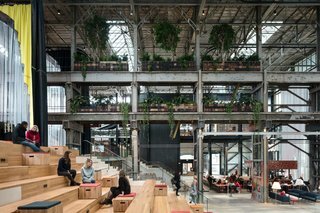 The renovation of this one-time locomotive shed into a multipurpose library still kept its industrial aesthetic. Rather than thinking of a library as a place to either read or do research, the recently opened LocHal Library envisions books as one of the many entertainment options available in this public space. 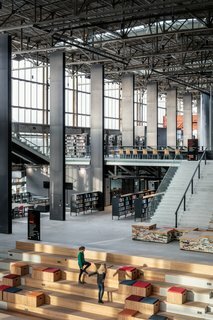 The Amsterdam–based studio Civic Architects teamed up with Braaksma & Roos Architecten and Inside Outside to reinvent a one-time locomotive shed into a vast community center, where reading rooms can be found alongside event seating for 1,000 visitors, and six giant moveable walls can divide open spaces according to changing needs. Concrete, black steel, and glass were used to complement the original industrial features of the property, and oak was chosen to offset those details with a natural finish. And the best part? The third floor has panoramic views of the city. There's event seating for up to 1,000 people in the midst of the library, as well as partitions to separate the space. The Khalifeyah Library was one of the first public libraries in Bahrain when it opened in 2016. 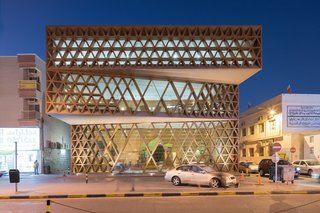 As one of the first public libraries in Bahrain when it opened in 2016, the Khalifeyah Library was built by SeARCH Architects to reflect the surrounding straight-lined architecture of the area while also standing as a modern centerpiece in a new era of the neighborhood's design. In order to minimize harsh sunlight from entering into the building, a net of cantilevers were built on the front facade to provide shade. On the interior, the grid creates equally intriguing diamond patterns that shift with the passing hours. 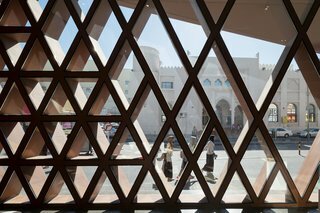 The exterior's grid structure acts as an ultra-modern facade, but also blocks harsh sunlight from entering the building. 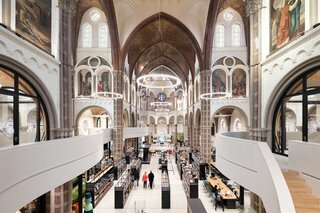 While the majority of this 12th-century cathedral was left intact, the renovation created a modern mezzanine that extends from the ground floor outside. While this structure may still have the external appearance of a historical cathedral, the interior is actually a dynamic library. 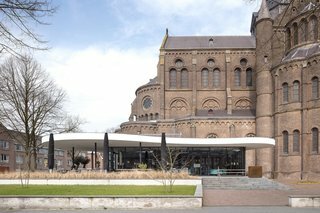 When the firm Molenaar, Bol, and VanDillen Architecten renovated this church, which dates to 1184, they aimed to create a library and museum that could also function as an event space. So, they built a mezzanine in the center of the church where all of the library's bookshelves are on a rail system. This not only preserves the main structure of the church, but it also allows for the books to be easy to move when large events take place several times a year. All of the bookcases are organized on a rail system that makes them easy to move for large events. 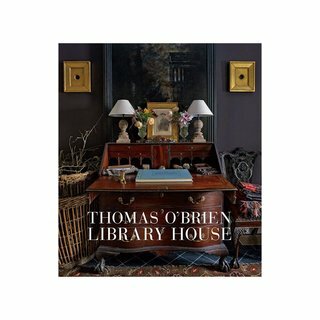 Thomas O’Brien’s name has long been synonymous with vintage elegance, modernism, and warm, livable design, so it’s no surprise that his luxurious homes in Bellport, Long Island, have attracted significant attention. 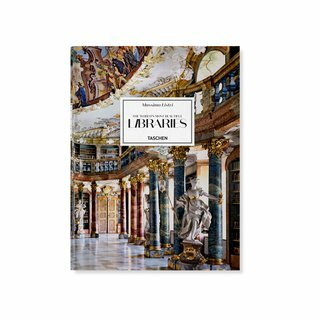 Temples of Knowledge Exceptional access to the world’s finest libraries From the mighty halls of ancient Alexandria to a camel bookmobile on the Kenyan-Somali border, human beings have had a long, enraptured relationship with libraries. The new addition of the library was built to complement the original 19th-century structure, which was once a school. 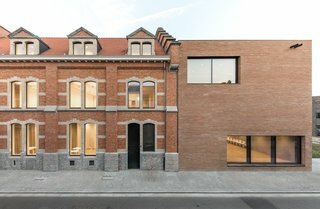 When KAAN Architecten named this library after Thomas More's famous work of the same name, it was meant to pay homage to Dirk Martens, the man from this Belgian city who first published the book. But the firm also ties in history from the building itself, which was once a 19th-century school where soldiers' children were instructed before their eventual enlistment. The firm kept its classic brick exterior, and added even more brick—plus solar panels, LED lighting, and geothermal heating—to the sustainable addition. The concrete bookcases have the illusion of being supported by the books themselves, and all ceilings were made to feel as light as possible. On in the inside, the brick is continued on the original exterior, and meant to contrast the surrounding wood and concrete. This library's fish pond serves a dual purpose: it teaches visitors about aquatic farming, and provides water for the surrounding hydroponics. The owners of this space asked the firm Farming Architects to incorporate husbandry and water components into the design, and the results give a hands-on learning experience to the idea of a library. The modular build, which was completed last year, consists of wooden beams that provide shade and seating, while also shielding chickens who lay eggs there. 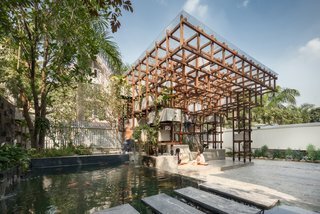 There's also a nearby koi pond, and children are encouraged to see how its water filters into the plants dotting the structure. 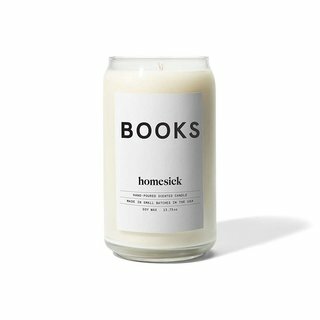 Needless to say, there's plenty more to explore beyond books here, but flipping open a cover is welcome, too. 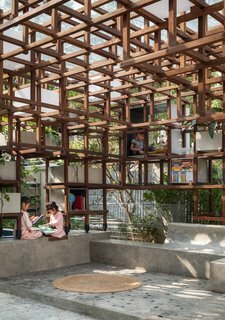 The geometric structure provides shade and various outposts to read—it also can act as a jungle gym. The corners of this diamond-shaped library were raised to make more room inside for millions of books. The architects at OMA had quite a few books to account for within Qatar's National Library. The structure needed to be home to a nationwide collection, of course, but it also needed to fit in city, university, and historical titles, too. There were to be more than a million books in all, with thousands of readers, so the library needed to be big. OMA designed one as long as two 747 aircrafts, complete with a central entrance that showcases all of those titles at once. 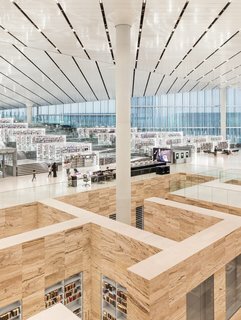 The edges of the building are lifted to provide even more room for the books, and the floors and shelves are encased in white marble for a uniquely dramatic finish. 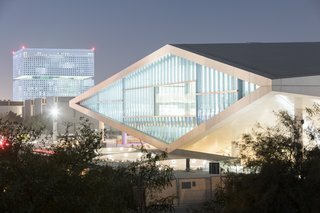 The National Library is part of Qatar's "Education City," which hosts satellite campuses of renowned universities from throughout the globe.